This past Sunday, July 8th, we celebrated the Sacrament of Baptism of a young child in our parish family. 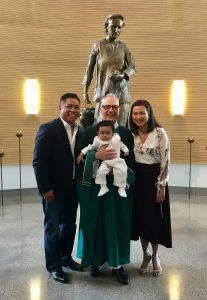 Lorenzo Gabriel was baptized into the life, death and resurrection of our Lord Jesus Christ. For some, witnessing a full immersion baptism was a new experience.